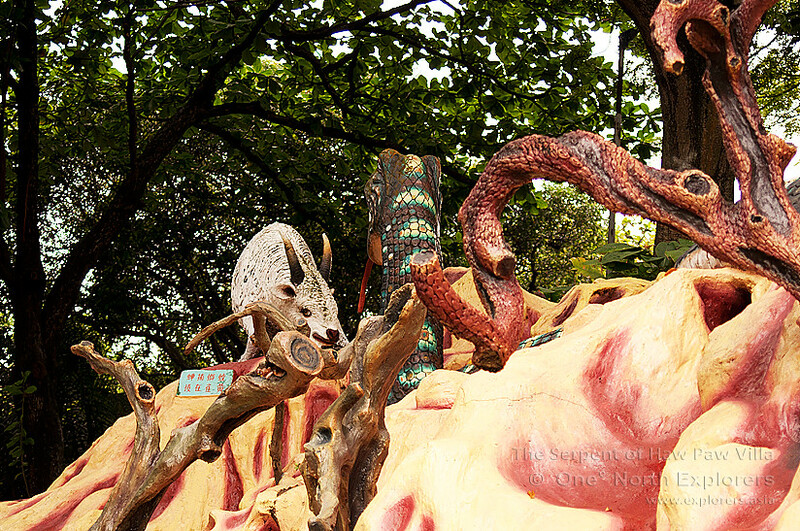 I'm sure many Singaporeans, especially those who grew up in a greater part of the eighties and nineties, has visited our very own Haw Par Villa before. 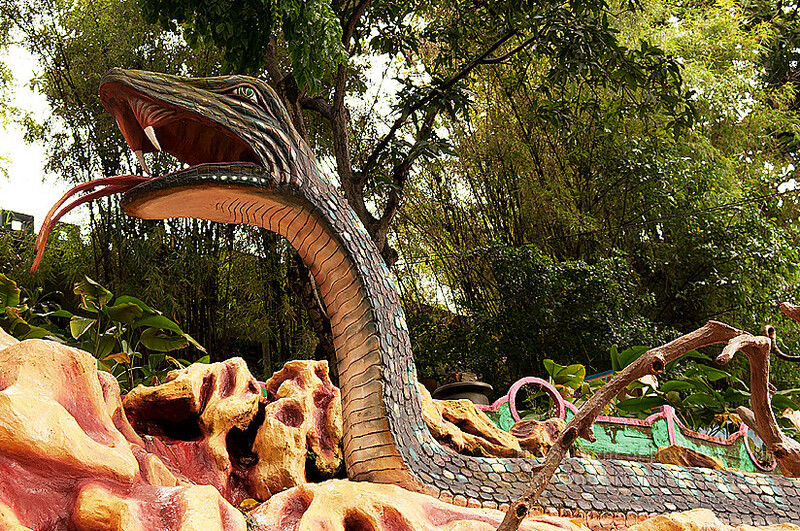 However, as you enter the majestic entrance archway of the mythological theme park, did you notice the diorama of an epic struggle between a ram, a serpent and a tiger on the right side of the entrance? 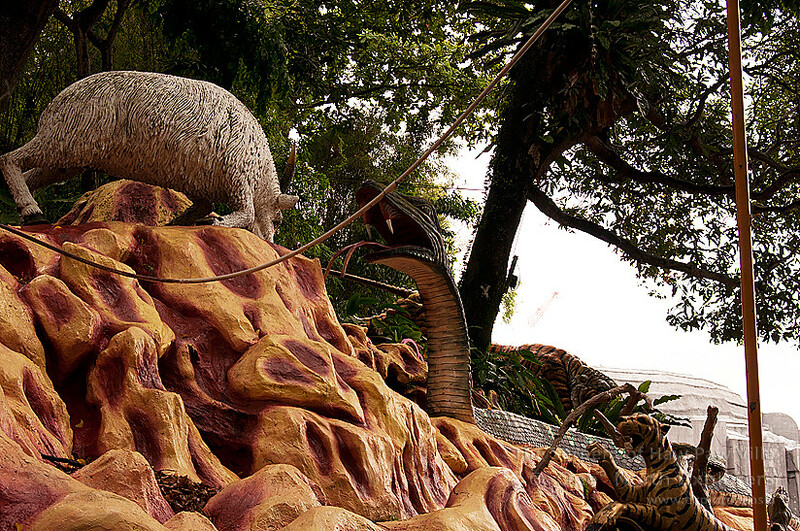 Many younger Singaporeans may not know of a dark tale involving the seemingly harmless stone sculptures, but there is more to these statues than meet the eye. A well-known "urban legend" surrounding this diorama is often circulated amongst the older generation and I wouldn't be surprised if the story is virtual unknown among the younger community today. This story was widely circulated by the Chinese community during the early nineties, during the halcyon days of the theme park. 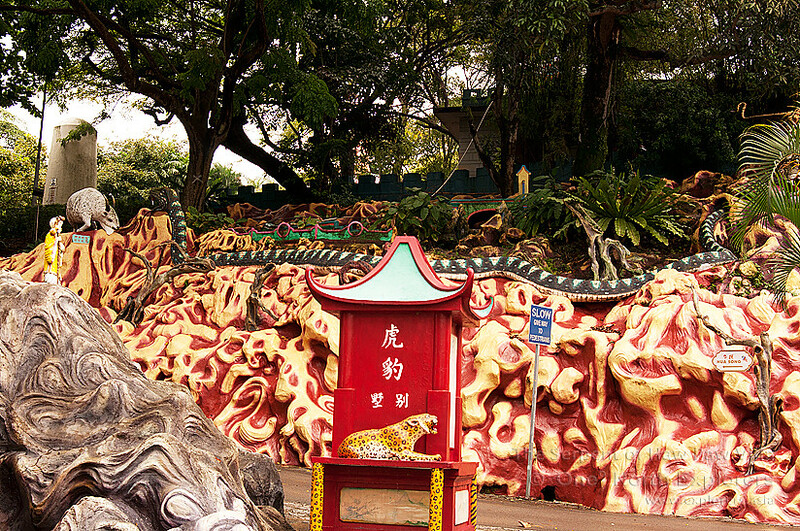 The park was simply known as Tiger Balm Gardens and was opened to the public for free before the Singapore Tourism Board took over the management of the theme park and starting charging astronomical figures for entrance fees (which ultimately led to its downfall). It was initially built for Tiger Balm tycoon Aw Boon Par in 1937 and donated to the Government by the Aw family, afterwhich it was put up for public tender as a theme park in the late 1980s. In its first few years of operations as a theme park, the park would be sprawling with visitors in the day. However, after sunset, strange things began to happen. Stray animals such as dogs and cats would be found dead near the entrance of the park. It seemed like a bad omen. Speculation was rife that the media never reported the findings in order not to create panic among the public, nor to discourage the paying public from visiting the park. The string of discoveries of the stray carcasses was "swept under the carpet", so to speak. The guards who patrolled the grounds found it weird too, but they never questioned or discussed the reason behind the brutal maulings as it was very "pantang" (taboo) for them. On a moonless night, a guard was patrolling near the entrance when he heard a pack of dogs barking excessively. Holding up his torch, he couldn't see far ahead as it was very dark. Sensing that something was not right, his curiosity edged him closer towards the entrance although he was trembling inside. He stopped short of the gate when he heard dogs whimpering in fear. Shining his torch outside the entrance, he saw a gigantic tail of a snake slithering away into the darkness. "That can't be right" he thought. A snake had to be huge to own a tail of that size. As he panned his torch to look around the area , he got the shock of his life. 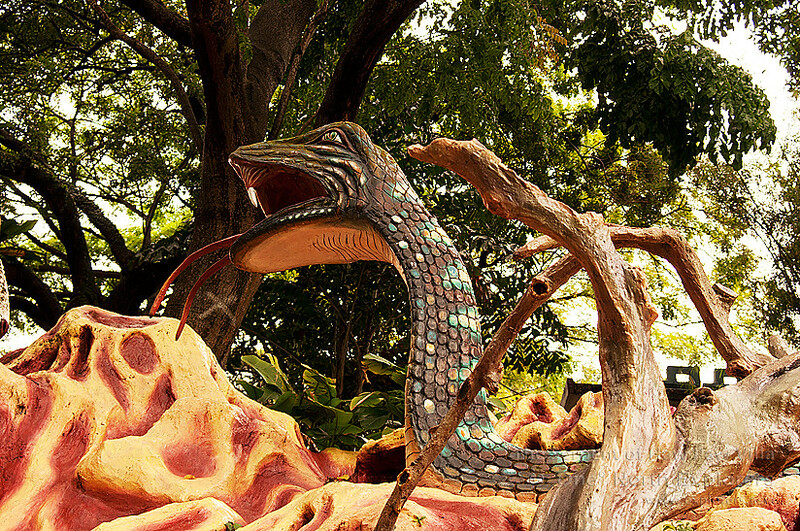 The serpent statue was missing from the diorama near the entrance. The guard resigned the very next day. This particular guard is still alive today and he turns hysterical when he sees snakes of any kind after the strange events of that fateful night. 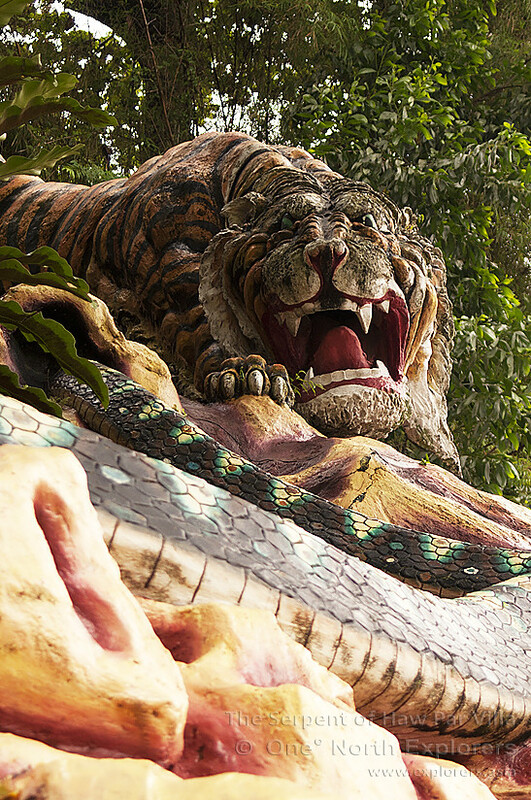 Stories of statues "coming alive" is not unheard of, especially of the ones in Haw Par Villa, where close to a thousand statues of various mythological backgrounds are housed. However, animated statues which kill living creatures such as the serpent in this particular story make it more interesting, especially if told in front of a campfire or over a cup of coffee in a kopitiam. Was this urban legend created by someone to scare would-be thieves away from the theme park? Many perpetuators of this urban legend claim to known to have personally seen or know someone who has seen the carcasses of cats and mostly dogs strewn around the park entrance, hastily removed by cleaners before the public started trickling in after sunrise. Could it have been some person who "created"the urban legend by killing hapless strays in the area, giving rise to these stories? Fun Fact: Next to the ram, there is a small signboard with the following Chinese words: "The mantis stalks the cicada, unaware of the oriole (a species of bird) lurking behind itself". While there are no insects or birds around, this saying is a reflection of the diorama's situation. The mantis (the snake) is about to close in and strike its prey, the ram (the cicada), but it is not aware that there is an oriole (a tiger) behind it, ready to pounce anytime. This saying basically teaches us to be aware of our surroundings, to always be careful and watch our backs, and not to have a narrow field of vision such as the serpent in this diorama. Although one may seem to be in pole position or a sure-win situation (often at the expense of someone else), there is always an "oriole" behind us, waiting for the right moment to strike.